When it comes to decorating for fall, most Americans opt for a triangle-eyed jack-o’-lantern with a toothy grin. Talk about boring. Why play it safe when there are so many adventurous pumpkin projects floating around? To truly take your decorating skills to the next level, ditch the pre-packaged carving kits and let your creativity run free. There are plenty of opportunities to glam up every room of the house with some pretty pumpkin projects. To help you get started, here are 21 awesome crafts that will help give your home some autumn-inspired glamour. Follow the links in each heading to learn more from the craft masters themselves! 1. Instead of carving your pumpkin, try using a drill to make these incredible lanterns. 2. This graveyard diorama is the only cemetery I’ll be checking out after midnight. 3. Not all pumpkin projects need to be scary. This Cinderella carriage is perfect for the princess in your household. 4. Use the force and try transforming your pumpkin into the Death Star. 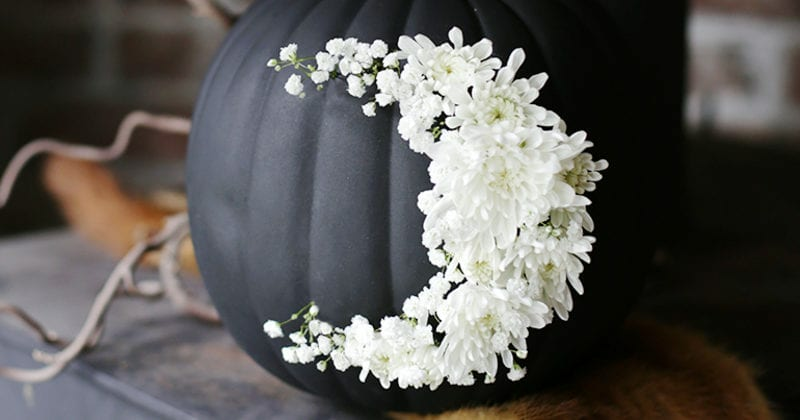 5. Who doesn’t love glow in the dark decor during the spookiest time of year? 6. Bring the city to your farmhouse with skyscraper pumpkin art. 7. For all the sassy homeowners out there, try making these pun-kins. 8. Write your own decorative story with this wordy pumpkin craft. 9. These black cats won’t be dishing up seven years of bad design luck. 10. A glittery pumpkin is out of this world. 11. Build a miniature fairy garden. 12. Forget your traditional table runner and use some pastel-painted pumpkins instead. 13. Add a bit of elegance to your home with a floral moon design. 14. Starving? These donut pumpkins look good enough to eat. 15. And these confetti pumpkins will give you a reason to celebrate. 16. Simply wrapping a pumpkin in twine brings the rustic glam. 17. Set off a colorful explosion with this melted crayon project. 18. Add your favorite jewels to create a totally blinged-out decoration. 19. You can’t go wrong with this modern take on floral print. 20. This decorative pumpkin might make you a bit batty, but only because it’s so cool. 21. Live near the ocean? Give this nautical craft a try! Now that I’m feeling inspired, it’s time to become a pumpkin-decorating master.